The version is currently able to grab the Android app window and display sprites! I hope this will help with porting SFML officially to Android. It requires Android 2.3 or later, as it's based on NativeActivity (aka no line of Java is needed). The changes consists of all the EGL initialization, change glVertex to GLES1's glDrawArray, and deal with a decent number of idiosyncrasies with the default Android app window. It's currently not possible to create additional windows, not sure if that's possible. Post effects will probably require a full GLES2 version, as shader don't seem to be available as extensions in a GLES1 environment (unlike "desktop" OpenGL). SFML 2 is a lot easier to work with regarding porting to other systems (Window and context are separated, vertex arrays are used instead of immediate rendering, etc. ), and I'm planning to improve it further to provide a robust and flexible base that can hopefully be ported easily enough to iOS, Android, etc. - My first (and free) game: BichingISH! Android C/C++ apps are also launched very peculiarly (it's really a Java environment that calls various hooks / event handlers in the application .so library, with android_main() usually started in a separate thread) - not a classic executable with a main().. I am actually wondering if you have changed the public interface any? While I think of it: one of the Android-specific changes that will be needed is the ability to resume a paused or killed application, including reloading all the OpenGL resources. Awesome! 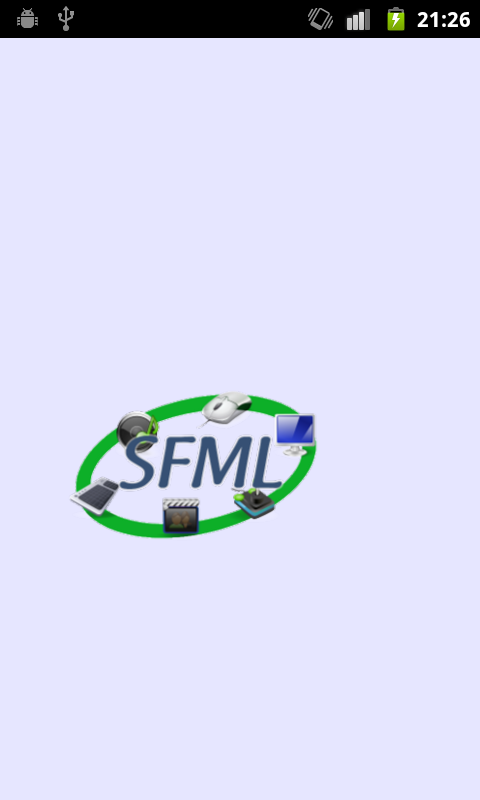 Keep up the good work, I would be really interested in working with sfml on android!